What we are trying to do is create a database on one machine, dump it in a way which is most diff friendly and commit the dump to a change control system (git). On another machine we want to poll git and when there is a change rebuild the database. A bare repository is one which does not have a working copy checked out. A bare repository is how you implement a system similar to a CVS or SVN repository: a hub repository. 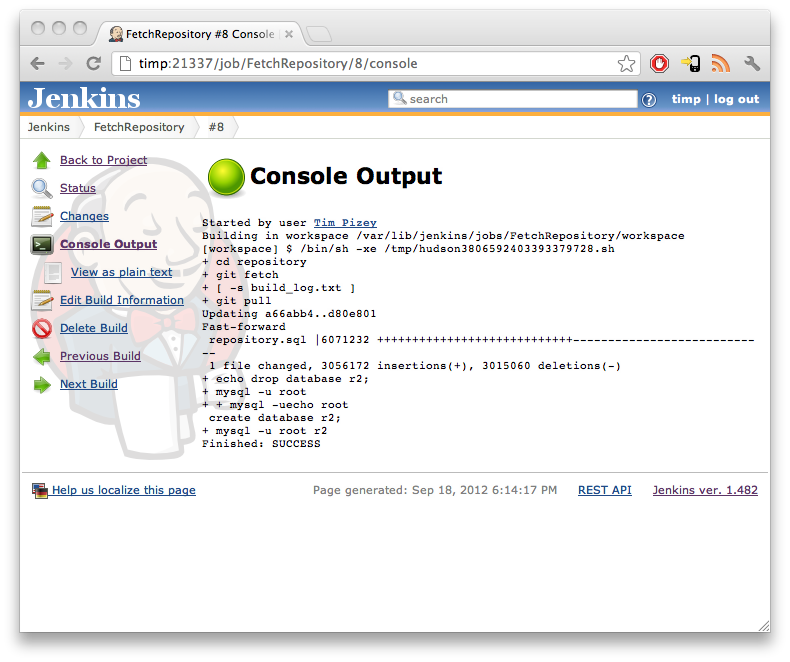 The problem is that Jenkins is not root. 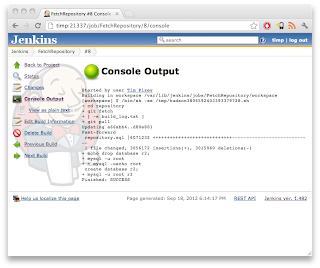 In the past the work Jenkins is doing would be done by root invoked from cron. 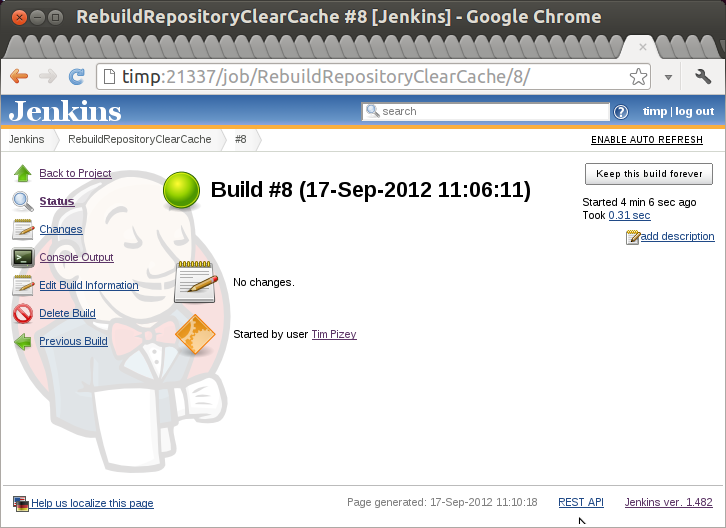 Our scenario is to build and deploy to Tomcat7 and then invoke the deployed web service from Jenkins. The web service downloads a lot of files to a cache. 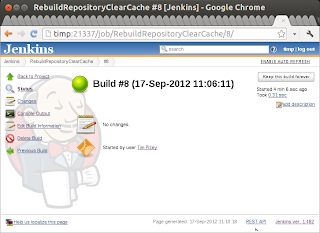 Once a week we want to clear the cache, from Jenkins, but the files in the cache are owned by Tomcat7. The solution is to put Jenkins and Tomcat7 into the same group. Edit the tomcat startup script /etc/init.d/tomcat7 and change the umask value to 002.
echo "// AUTO-GENERATED FILE from /etc/tomcat6/policy.d/" > "$POLICY_CACHE"
Make Jenkins a member of the tomcat7 group. The job should succeed next weekend. To reclaim disk space used by an old MySQL database it is not sufficient to drop the database. This is a famous 2003 bug. It is unbelievable that an infrastructure element as crucial and ubiquitous as MySQL has any outstanding bugs, let alone loads. Assuming you are using InnoDb tables (the only sane choice if you want normal SQL functionality, such as transactions) then by default the data will be stored all on one big file. You will not be allowed to move the data unless you configure appArmor. Another approach is to dump, drop, delete and recreate your databases. So lets move our modified /etc/mysql/my.cnf out of the way and reinstall mysql. My HTC Desire lost the ability to power off. Holding down the off button would send it to sleep, but the power down menu no longer appeared. Initial googling suggested that this was due to an update, but as my wife and i have the same model on the same network I thought that unlikely. Magic: power down now works. you can uncheck it again and it continues to work.